Rye Area Business Forum has given a massive thumbs down to County Council proposals for Civil Parking Enforcement (CPE) in Rye, and following the meeting on December 3, a three-page letter went to County Hall on Tuesday, December 4, (with copies to all local councillors); and the Town Council will also discuss CPE at next Monday’s meeting (December 10). East Sussex County Council (ESCC) had exhibited its CPE plans in Rye’s Town Hall last weekend and this has raised many causes for concern. Chairman of the forum Rebekah Gilbert drafted the letter on behalf of Rye area businesses, whose comments that evening included that “what is currently proposed is not fit for purpose, and is considered by many as something that will break our town if implemented”. CPE is being introduced as the police have made it clear that they are no longer able to deal with parking issues, but there has been little involvement with the town by either the county or district councils on developing the proposals, and what is proposed is essentially existing parking restrictions enforced in future by parking meters and wardens. The businesses felt the County Council (ESCC) and the District Council (RDC) were trying to find a solution without understanding “the root cause of the problem, namely lack of parking in the town” and said “the bigger picture needs to be addressed first”. 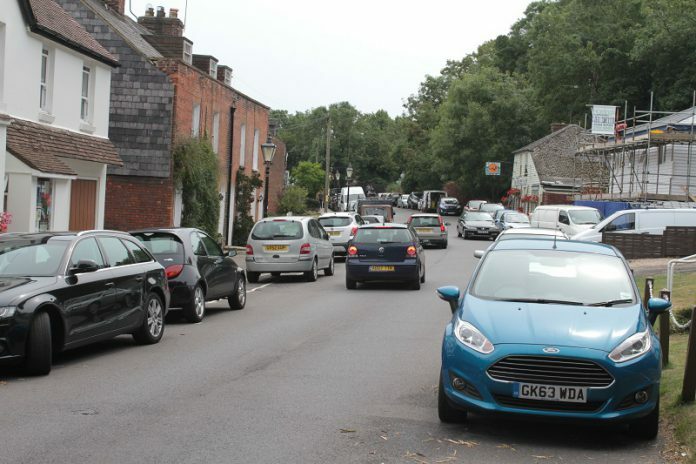 “Fundamentally,” say the businesses, “consideration must be prioritised to look for additional parking spaces around Rye.” Possibilities, they suggest, include a “park and ride” from the Camber direction, parts of the Salts, or the “lower school site” off Ferry Road alongside the railway line. However they also draw attention to the under-use of the RDC-run Gibbets Marsh car park. Other issues concerning the businesses as well as residents were the size of parking meters on Rye’s narrow pavements in a historic conservation area and the probable need for more residents’ permits. The businesses expressed concern that the parking meters would simply displace parking issues to areas near to, but outside, the town centre (such as Military Road, pictured above) and said “displacement is not factored into this proposal, which we feel is a grave error”. The proposals were perceived to be “purely revenue related” by the businesses, and the businesses said they wanted to invite district and county councillors and officers, along with local MP the Rt Hon Amber Rudd, to a meeting in Rye in mid/late January to discuss the issues. Rye Town Council will be discussing the issue on Monday December 10 and the meeting (open to the public) starts at 6:30pm. The Neighbourhood Planners have drawn the attention of the ESCC Team to the policy and aspirations on traffic issues in the Plan Submission currently publicised for public representation. There is little in the comments of the Rye Business Forum which conflicts with this work. Anyone who has looked at the issues, sees multiple groups in Rye with parking interests: the visitors; Citadel residents; other residents; traders and business people. This makes for a complex situation not only in the confined space of the centre of Rye, but in unrestricted outer streets. It points to the need for a holistic review of parking rather than a focus on just the areas of ESCC responsibility, as CPE is doing. Any measure applied to one place affects at least one other (the “displacement of vehicles concept”). Civil Parking Enforcement (CPE) would impact widely on most streets within 10 minutes walk of the Centre. For instance there are some non residents parking now in Kings Ave, Military Rd and in the West Rye to avoid Rye Centre restrictions. Any arrival of the Fast Rail link would increase demand around the Station. CPE would only aggravate displacement. For this reason and given the inter-related relationships of the various parking sites – particularly those at the various gateways to Rye – any review should be looking at all parking (around 900 spaces) including the Rother and privately owned sites. Those working on the Neighbourhood Plan (NP) considered the need for additional parking but no obvious proposal was supported. For instance, some were against the use of the Salts. Camberfields remains a possibility, but access is difficult and ownership recently moved from Rother to private. It is also very wet after rainfall. The NPs considered two tier options on one or two existing sites (suitably screened) on the North side of the Centre. This would require significant private investment. Blue badge parking is an issue now and is unlikely to improve under CPE as blue badge drivers seem to regard all double yellows, even where road width is minimal, as fair game. There should certainly be a universal residents parking scheme for those in the Centre, perhaps time limited and restricted to one badge per household to encourage all residents to make permanent arrangements for their long term parking (garages or long term passes on the paysites – many do this). Hotels need to do the same. The selling of multiple street permits for overnight guests discriminates against those residents and others paying council tax and business rates. Signage around Rye is poor and unfocused. The NP aspires to a Rye wide review and improvements. Street furniture related to CPE must be appropriate for Rye. Meters the size of a human with solar panels attached are unsuitable. I know that some will say that all this is impractical and would take years, but if comprehensively staged, would enable CPE to get under way, with wider measures thoroughly considered before implementation. I understand the concerns of business about the parking proposals. But a major problem is the irresponsibility and arrogance of private car owners parking on pavements and double lines in the knowledge that they will receive no penalty. The other day I saw a woman park her Volvo, an enormous car, on the double lines outside of Rye Shoes and directly opposite the junction to Market Road. She was not a Blue Badge holder. If a large vehicle had wanted to turn into Market Road it might not have been able to do it, or be forced onto the pavement, causing a danger to pedestrians. It is sheer laziness. The Gibbet Marsh Car Park is only a few minutes walk from the Town Centre and is usually empty. The residents of Rye need to be educated into using car parks for shopping and not parking in the street. Although Anthony Kimber and his team have worked tirelessly setting up the Neighbourhood plan, who makes the final decisions on the future of Rye,the town Councillors that we have elected or his team, making statements that some are not keen on I presume turning the middle Salts that is used a couple of times a year, into a car park,who are these people, and surely our Councillors that we have elected, should have the final decisions on this, and not some, who are against this sensible option. Thank you. For the record, the Neighbourhood Plan belongs to Rye Town Council and is being made on behalf of the Rye Community (the Neighbourhood). The “team” is the Steering Group chaired by the Mayor and includes more Councillors than citizens. Councillor Michael Boyd is the fourth Mayor to lead the process. Each step of the Plan has been approved or adjusted by Rye Town Council, to which the Steering Group reports in Public in the Council Chamber, every two weeks. Therefore only elected representatives take the final decisions. The next stage report in early 2019, will remind about the advantages to having a Neighbourhood Plan. Even though I’m known for my extreme views on Rye parking I agree with much that has been posted to date, in particular that the CPE proposals are ill conceived and not fit for purpose. Indeed this is what struck me when I visited ESCC’s exhibition on 1st December. It was clear in very short order that if you didn’t agree with the proposals you were regarded as a wayward headstrong Luddite who needed to be despatched for re-education in a Bexhill Gulag! Lip service was paid to “consultation” but the intonation and body language of the androids sent from Lewes made it obvious that resistance was futile! I saw them packing up later on and it was clear that they couldn’t wait to get out of town [NB most of them had never visited Rye before]. So all in all a complete fiasco and a total mockery of any sort of locally based decision making process. Finally, the proposed parking meters have been described as “Daleks”. Well Daleks aren’t over 2m tall and do have a certain charm. These things look like they’ve been stolen from the set of the remake of Robocop! It wouldn’t be a surprise if they machine-gunned you if you overstayed your timeslot!! The plans do not take account of the citadel residents, in particular those in Market St. and East St. where by my reckoning, we outnumber business by a considerable margin. I use local shops and businesses continuously, as do other residents I know. But it is clear to many of us that a balance should be set. It seems only be fare to make proper account for us who live up here by the provision of annual permits, setting aside at least half the spaces the purpose. In this respect, the current proposals appear to be at odds with the Dept Transports own Statutory Guidelines under the Traffic Mgt act 2014; someone more qualified than me may like to respond to this. It is worth remembering that permanent residents, like businesses, are also under pressure and dwindling in number. We should be encouraging people to move in rather than discourage them. The citadel already has too many empty houses for tourists to puzzle over. Removing all possibility of parking for the remaining residents,will not help matters and should be a consideration. There is little to add to Anthony Kimber’s excellent summary except the suggestion that the Thomas Peacock site – currently with a planning application for flood plain housing (and inadequate parking provision) would be the ideal site for a new car park. It is disappointing though that despite major dissatisfaction with the current situation the proposed solution has met with such stiff opposition. Surely we cannot go on as we are? Lack of enforcement means parking anarchy. Do people seriously wish that to continue, with obstructed pavements and damaged houses? The challenge is to create a parking strategy that meets the needs of Rye as a whole. The risk of only managing the central areas of Rye is we displace cars and create the same problem of obstructed pavements and damaged houses elsewhere in Rye, which seems unfair. We need a piece of joined up thinking to put in a place a parking strategy that meets today’s needs and factors in future development opportunities. Oh dear: parking! An Englishman’s home is his castle but where doth she park her carriage? I must say when I saw the proposed parking scheme I was surprised at the lack of residents parking, as all schemes I have come across in the past include a reasonably cheap residents parking permit (my last one when I lived in the London Borough of Richmond was £65 a year). On closer inspection it looks to have been prepared by people who haven’t a clue what with Dalek and Robocop ticket machines, little resident parking and completely ignoring the scarey parking in Military Road and South Undercliff. I agree with Martin Blincow above that it needs a bit more thought and joined up thinking, but more than that some proper research: not a favourite of politicians (and I have worked with them) as it quite often provides answers they don’t like. The competing interests of groups outlined by Martin are a good place to start a proper survey.